With a hint of creaminess and the unmistakable taste of ripe peaches, I Love Taffy is a perfect all day vape. 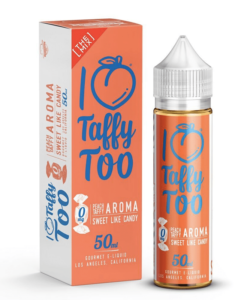 I Love Taffy is hand-crafted in Los Angeles California and is specially blended to deliver enticingly sweet, thick clouds while never compromising on flavour. Each I Love Taffy 60mL bottle comes with a one of a kind taffy box to complete the full vaping experience.